Turkish officials tell NBC News that authorities believe the critic of Saudi Arabia was killed at the Saudi Consulate in Istanbul. Turkish authorities believe that journalist and Saudi Arabia critic Jamal Khashoggi, who disappeared in Turkey last week, was killed at the Saudi Consulate in Istanbul, a senior Turkish official and another regional diplomat told NBC News. The Washington Post, which published Khashoggi’s work, reported Saturday that Turkey believed he was killed by a Saudi kill team, citing two people with knowledge of the investigation. Khashoggi, a Saudi journalist who writes an opinion column for The Washington Post, disappeared last week after entering the Saudi consulate in Turkey’s largest city and hasn’t been seen since. Saudi Arabia’s government has said Khashoggi left the consulate building and that they’re looking into what happened to him afterward, while Turkey had said previously it believed Khashoggi was still in the consulate. "If the reports of Jamal's murder are true, it is a monstrous and unfathomable act,” Hiatt said. In a statement released late Saturday, the Saudi Consulate in Istanbul denied the reports from Turkish officials, calling them "baseless allegations." The statement said a Saudi security delegation arrived in Instanbul on Saturday to help authorities investigate Khashoggi's disappearance. Khashoggi is a Saudi citizen. The Committee to Protect Journalists on Saturday called on Saudi Arabia to account for Khashoggi's whereabouts. 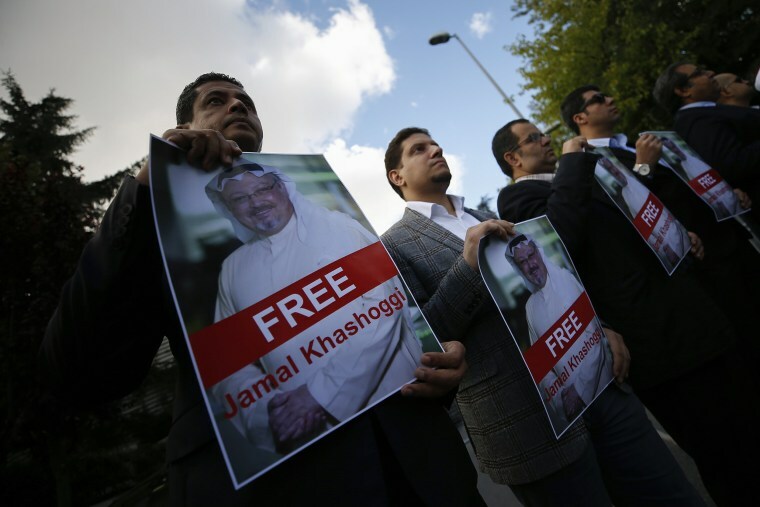 "CPJ is alarmed by media reports that Jamal Khashoggi may have been killed inside the Saudi Arabian consulate in Istanbul," said CPJ Deputy Executive Director Robert Mahoney. "The Saudi authorities must immediately give a full and credible accounting of what happened to Khashoggi inside its diplomatic mission. The country has stepped up its repression of critical journalists in the past year at home. We hope this has not now spread abroad." If the Turkish allegation proves true, it would demonstrate an alarming willingness by Saudi Arabia to use force overseas to quash criticism and stifle opposition the political rise of Prince Mohammed, who has embarked on an ambitious but controversial campaign to modernize the kingdom. In the process, Saudi Arabia under Crown Prince Mohammed bin Salman has drawn scrutiny for arresting women’s activists and jailing princes and elites in an aggressive anti-corruption campaign. But the government is not known in the past to have sought to kill dissenters far beyond its sovereign borders. The Turkish official did not speculate about who in the consulate killed Khashoggi or why, nor would the official say what evidence Turkish police had. The other diplomat briefed on the situation said that intelligence collected since the disappearance suggested that his body may have been removed from the consulate in boxes. Khashoggi’s disappearance appears to have played out as he sought documents related to a divorce that he needed for his upcoming marriage to a Turkish woman, four individuals with knowledge of his situation told NBC News. Khashoggi had sought previously to obtain the needed papers through the Saudi Embassy in Washington, but had been directed to the consulate in Istanbul, prompting concerns for his fiancé that he was being lured into a trap, a friend of Khashoggi’s said. After going to the consulate in Istanbul, he was told to return on a different day, two other individuals said. It was on that return visit that Khashoggi disappeared, they said. Turkey and Saudi Arabia, both major regional powers, have long had tense political relations. But the relationship has been further strained over the last year amid Qatar's diplomatic spat with Saudi Arabia and the United Arab Emirates. Turkey has aligned itself with Qatar in that crisis, and the tiny, gas-rich nation recently reciprocated with a $15 billion investment to help Turkey weather its economic troubles. The Saudi government has said emphatically that Khashoggi is neither still in the embassy nor in Saudi Arabia. On Saturday, the consulate allowed Reuters journalists to tour the building to see that he was not being held there, The Washington Post reported. Crown Prince Mohammed, the powerful son of King Salman in line to be the kingdom’s next ruler, has acknowledged that Khashoggi entered the Istanbul consulate but said that he departed “after a few minutes or one hour." He said Saudi Arabia doesn’t know what happened to him but is investigating along with Turkish authorities.